Garnet, which is often thought of as a gemstone to give to the one you love, shines through in this garnet and diamond birthstone ring! 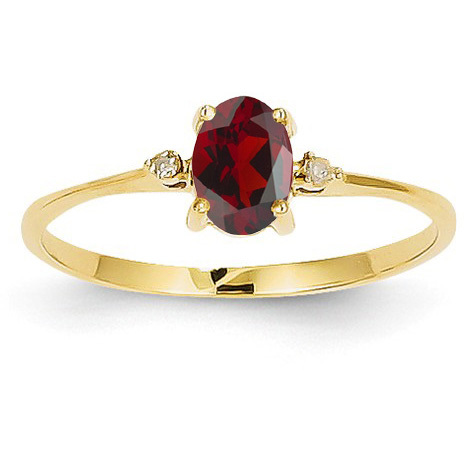 Apples of Gold Jewelry offers an authentic crimson red garnet gemstone, which measures 6mm x 4mm, settled nicely on a 2mm 14K yellow gold band. On either side of the garnet gemstone lies a small, yet beautiful diamond that adds extra sparkle and allows the garnet gemstone to pop! This unique design birthstone ring also makes a wonderful engagement ring or statement piece. We guarantee our Garnet and Diamond Birthstone Ring in 14K Yellow Gold to be high quality, authentic jewelry, as described above.